Littlerock California is a quiet little town located in the "fruit basket" of the Antelope Valley. It's also the titular town of Mike Ott's new film and the place where two Japanese tourists, siblings Rintaro and Atsuko, end up after their car breaks down while en route to San Francisco. This is the duo's first trip to the United States and they end up stranded in small town California waiting for their new rental car to arrive. Their first night in town, the siblings find their way to a party with a group of local kids and it's there that they meet Cory, a friendly local smitten by Atsuko who offers to show the girl around town. From here, Rintaro and Atsuko hang out with Cory and his group of rag tag friends, mostly boys who spend their days smoking, drinking and hanging out. It's obvious from the get go that Cory is on the outside of the group, a really sweet boy who never seems to have any money, smokes or booze and constantly mooches off of his friends but everyone seems happy enough to let him hang out, sometimes as a joke and sometimes they genuinely seem to like the guy. When their new rental car arrives, Rintaro is anxious to leave but Atsuko has fallen for one of the local boys and convinces her brother to go to San Francisco by himself and come back for her later. As for Atsuko, she shacks up at Cory's place in a spare room and in the span of a few days, makes herself at home. She spends some of her time working with Cory at his father's Mexican restaurant where she meets the friendly Francisco, a local who doesn't speak English and works two jobs to get by, and her evenings at parties or with her new boyfriend. It's clear from early on in Ott's Littlerock that Rintaro and Atsuko's trip isn't going to end well and perhaps because of the eerie way the location is captured and the viewer's own expectations, at every moment we're expecting Atsuko, a young woman who speaks and understands no English, alone in a foreign place with people she barely knows, to end up in a ditch or abused (in a few scenes, Ott really plays with expectations, building moments of false tension) but the film maker has other plans, building instead a sweet story of people finding their way in foreign places. Even Cory seems out of place, with a spirit and aspirations too large for Littlerock; he's constantly plotting his escape to LA to become a model or an actor. One of the film's successes is the way in which Atsuko and those around her communicate without sharing the language, using looks and intonation to make themselves understood. 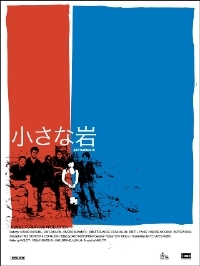 It's a tricky thing, one that may be foreign to anyone who has never been in that situation but Ott and co-writers Atsuko Okatsuka (who also plays the lead) and Carl McLaughlin (the film's cinematographer), write and deliver the nuance, half understood comments and the confusion with delicacy and authenticity. Particularly charming is how Francisco and Atsuko get on, almost immediately, two fish out of water making their way in this foreign land and the closing of the film beautifully captures the bond the two shared, even if they didn't fully understand it. In its final ten minutes, Littlerock takes on a different tone as Rintaro and Atsuko make their way to Manzanar, their true reason for coming to America. Some may immediately pick up the importance of the location but for those, like myself, not familiar with the place, reaching their destination adds a nice layer of meaning to Ott's film which will likely change the way the film is perceived the second time one sees it. Helped along by great low key performances, particularly from Cory Zacharia and Atsuko Okatsuka, Littlerock is a funny, beautiful and even haunting (particularly in its locale) tale of vacation adventure, romance and expectations while also being a touching tale of self discovery. Neat, I'm from Littlerock and currently back living here. Great hometown I wouldn't trade it for all the LA's in the world.